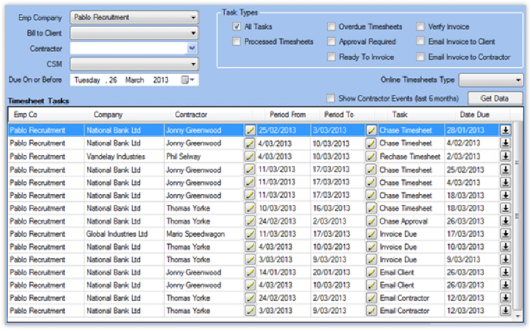 All your invoicing is taken care of with our fully integrated software. All timesheets are automatically invoiced, with invoices electronically distributed based on your customised invoicing cycle. You also have the option to have your invoices verified by a third party before they go to your client. We support consolidated invoicing, with manual processing to ensure clean, straight-forward paperwork. Our system will integrate fully with your accounting system for invoice data importation and supports both timesheet generated invoices as well as manual entry. We also provide the ability to configure and link ledger accounts (e.g. GST, expenses etc.) as well as supporting BAS reporting on a cash and accruals basis. Oncore also offers customisable step-by-step invoice recovery plans that instigate automatic chasing of payment, with prompt email and phone follow-up to help you manage your debtors.